Jaime and I originally brainstormed the idea for a Pinterest linky party when the two of us were emailing back and forth one day after discovering how much of our blog traffic was a direct result of some of our recipe posts being pinned and then repinned and repinned on Pinterest. We thought why not host a monthly Pinterest party? And thus, Let Me Pintroduce was born! 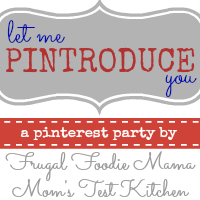 Please follow me (Frugal Foodie Mama) and Jaime (Mom's Test Kitchen), and this month's co-host Terri (Rambling Momma) on Pinterest. Be sure to link up your main Boards page of your Pinterest account only, not individual board pages. This is a wonderful idea! I love all the new ideas on Pinterest! Thanks for hosting! Following new people on pinterest! Great idea thanks! Followed all so far & tweeted. What a great party! I love meeting Pinteresting people! Great idea! Thanks so much and I can't wait to follow everyone. Thanks for the invite, I linked up! Thanks for hosting! I'm following all the hosts from http://pinterest.com/joannegreco/ . Hi, I found your blog through Make My Saturday Sweet on Amanda's Books and More. I am your newest follower. A follow back to Carole's Chatter would be fantastic. Hope you are having a good week. Oops, I entered my blog url instead of my Pinterest url...sorry!